Speech and Occupational Therapy Jobs Atlanta, Gwinnett | Therapy Solutions of Georgia, Inc. Therapy Solutions of Georgia, Inc. continuously seeks dedicated and qualified professionals to meet the ever growing need for pediatric therapy and to enhance the dynamic of the Therapy Solutions team. If you are seeking to gain personal success through professional achievement, then Therapy Solutions is the place for you. 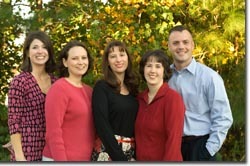 At Therapy Solutions we are as dedicated to you as you are to your patients. Therapy Solutions of Georgia, Inc. offers competitive salaries and benefits including a retirement plan with employer contributions, a group health and dental plan, a short term and long term disability plan, mileage reimbursement, and paid vacation and holidays. In addition we give an allowance towards licensing, dues, and professional development. To find out more about current opportunities simply give us a call at (678) 377-9634 or send us your resume. You may e-mail your resume to jobs@tsg-inc.net or fax it to (678) 377-9609. We look forward to hearing from you. Helping children manage Down Syndrome, Autism, Dysgraphia, Fluency, Stuttering, Sensory Processing and other disorders. Serving Dacula, Buford, Suwanee, Gwinnett and the surrouding area.